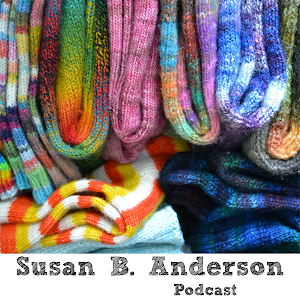 Susan B. Anderson: Unofficial Downton Abbey Knits Giveaway! Unofficial Downton Abbey Knits Giveaway! 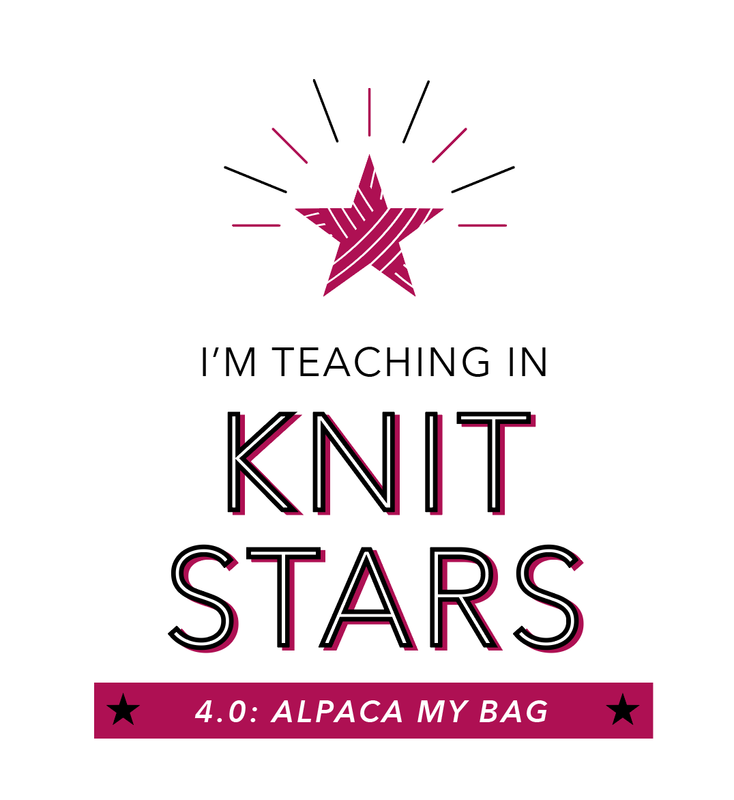 Quickly, I have to note that I am so honored to have been nominated for the Best Craftsy Instructor Blog in Knitting and Crochet! Wow, what a thrill to be nominated amongst such talented bloggers. Thank you! Now the award goes to the next round of voting to get a winner. 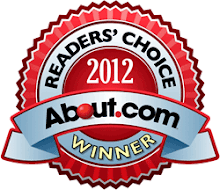 If you vote you will automatically be entered to win a free Craftsy.com class of your choice! Please head over, if you are so inclined, and vote. I appreciate it so much. The winner will be announced on Oct. 29th, 2013. Click here to vote! You'll see my sock drawer photo from my blog header on the correct category. I had to smile when I saw that up there. Okay, here we go with another fantastic giveaway opportunity for you! I received the new Unofficial Downton Abbey Knits magazine from Interweave a couple of days ago and I can't put it down. 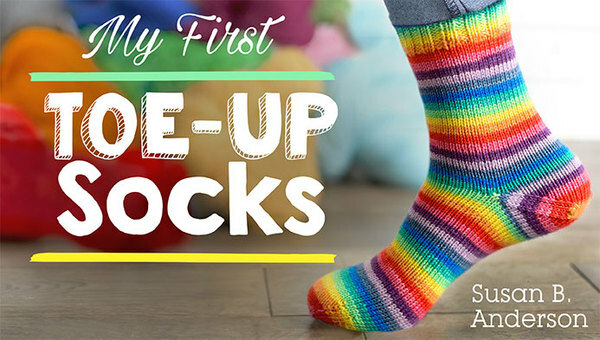 Click here to see all of the designs on Ravelry! 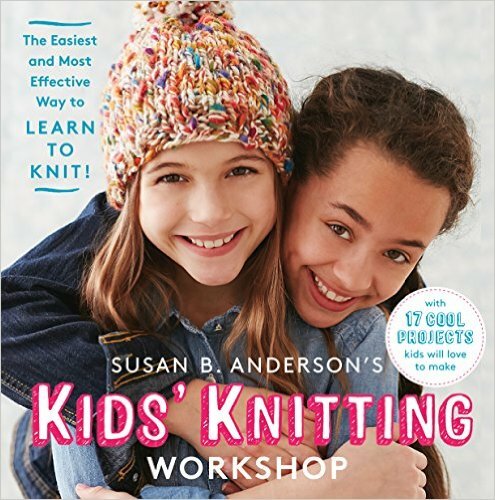 Click here to see the magazine on the Interweave website! The magazine is much more than just patterns. It creates a mood and lets the reader disappear for awhile in another time. There are historical articles, wonderful inspirational pictures, great projects both imaginative and practical and if you love the BBC show Downton Abbey as much as I do this is a must have special issue! Look through the eyes of Downton Abbey with this new special issue from PieceWork magazine. 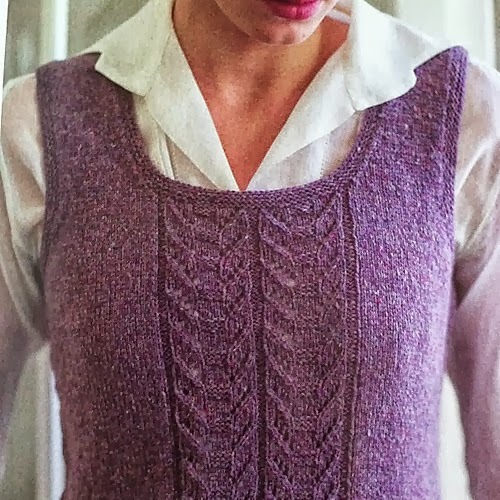 Enjoy knits inspired by the lavish sets and styling of the hugely popular television series, which tells the story of the Grantham clan and their servants at England’s Downton Abbey. This special issue includes: Knitted garments and accessories—gloves, shawls, sweaters and vests, blouses, hats, purses, and more—for both those upstairs and downstairs. 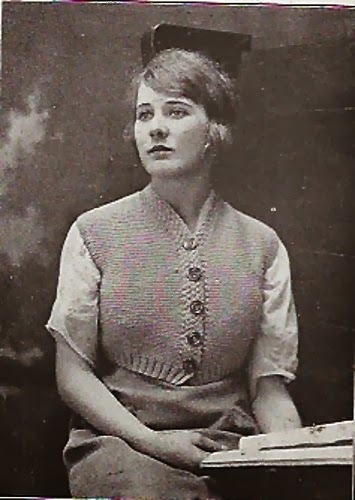 Learn about knitting for the troops during World War I and enjoy articles detailing aspects of the Downton eras: fashion, history, and culture. What a wonderful colorwork hat with a sweet pom-pom detail. 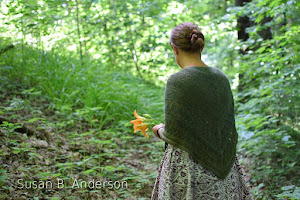 I want to make this for sure with my Harrisville Shetland collection of colors just sitting in my studio. I would wear the pom-poms not so close the face but more on the side and back a bit. The poms are on braids or twists and are then threaded through a loop on the side. I love this detail! Look for this one on my needles very soon, maybe even later today. Click here for the Fetching Fairisle Cap project page on Ravelry! I love this vest with the subtle textured panel on the front by Joanna Johnson. It is made in one of my favorite yarns, Brooklyn Tweed Loft. This one is a win. I would love to have a vest like this in my wardrobe. Click here for the Ravelry page for the Lady Denman's Vest! 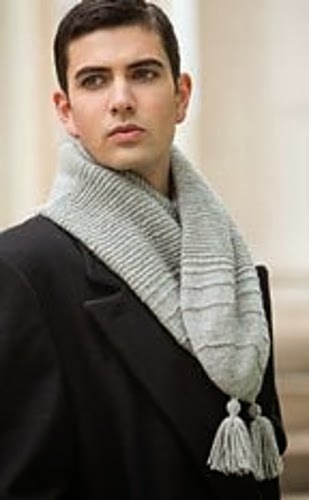 I love the clever twist of the Two in One Warm Hat or Cravat! 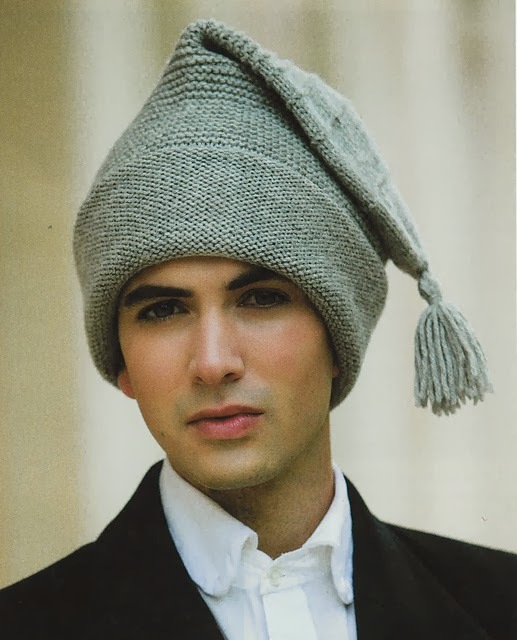 It is a long tube that is then tucked inside itself to create a double-layer stocking hat. I think this is great fun. Here it is as a cravat (or a scarf if you're me!). Click here for the project page for the Two in One! I think the detail on the Walking Out Eyelet Panel Blouse is lovely. I would wear this one for sure. It's a very sweet design that could easily be worn in our modern times. Click here for the Walking Out Blouse! In my cold climate I don't know anyone who wouldn't enjoy a Chilly Morning Cosycoat (I like the name of this one, too!). It is made out of Cascade 220 which is perfect. Isn't it wonderful? There are so many designs in this issue, something for everyone. 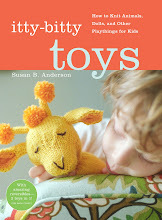 What a fantastic job by Interweave and the designers and writers! The magazine is selling for $14.95. I am so excited to offer each of 5 winners a copy of this extraordinary magazine! To enter to win please leave a comment on this blog post that includes your Ravelry ID or an email address where I can get in touch with you if you win. The winners must have a U.S. mailing address. 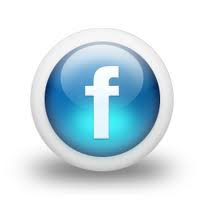 Please only leave one comment. It takes awhile for your comment to show up on the blog. Thank you to F+W Media and Interweave for this opportunity! What?? I can't be the first commenter!! Or maybe I can! Yippee! Would love this magazine! Maybe if I had the book, I would stop continually saying "DOWNTOWN Abbey!" You know...that eyes...read...brain connection! That...and I love the patterns! We just finished watching seasons 1-3 on PBS getting ready for season 4. Can't wait! Will it be the same w/o Matthew? The Chilly Morning Cosycoat looks like winner to me. Would love to win..love the hat. As a Downton Abbey lover, this book would be fantastic to win! LOVE!! Can't wait for season 4, and I'm loving all of the "Unofficial" issues Interweave is putting out. I can hear the theme music now. Thank you for all you do. I'd love to take a peek at this magazine! 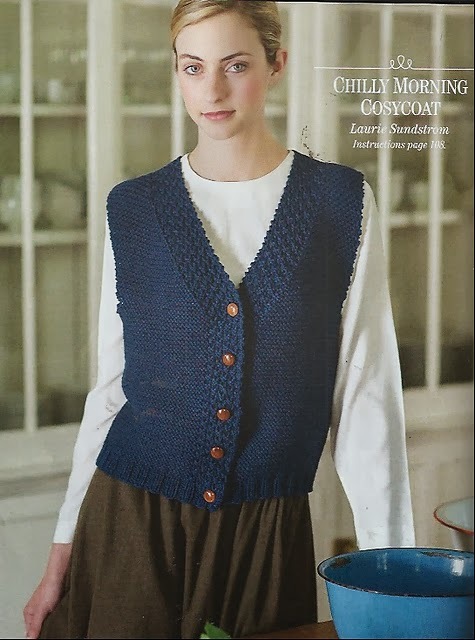 I would love to knit both of the vests in this publication! Thanks for the giveaway. I would love to be knitting one of those wonderful patterns as I watch Downton Abbey when it returns to the US in January! Pick me! I love down Downton Abbey, and the magazine looks wonderful! Love Downton Abbey. Would love to win this magazine. I'm loving that fair isle hat! Congrats on the nomination and thanks for an amazing giveaway! My sister and I are obsessed with Downton Abbey and I would love to win a copy! How exciting! Hope I win! What beautiful designs. My daughter would look so cute in that first hat. I hope I win. There are some nice patterns in this. Would love to win one of the copies. Knittinginhi on Rav, love this! Thanks for this awesome giveaway. I am DoTheMathPC on Ravelry. Love this and the show. Oh my goodness, this looks amazing! Would love this for my collection. I love Downton Abbey! Thanks for the giveaway! I'm a Downton Abbey addict and would love to have this set of patterns! I'm SandraFos on Ravelry. I love Downton Abbey! And those patterns are so fun. Thanks for the giveaway! I would love to win! I can get it sent to a U.S. address if I do. Love Downton Abbey, can't wait for the next series. Thank you for this opportunity! I was born in the wrong era! I LOVE Downton Abbey. Love this beautiful giveaway! Thanks for the chance to win! I love Downton Abbey and I LOVE patterns! Thank you for another great giveaway!!! As yet another Downton Abbey fan and a knitter, I would love to win a copy! Thank you for the give-away! trying again to win! coutrem on rav. I'm counting down the days to the return of Downton! These patterns are amazing. Another Downton Abbey addict here! I would LOVE to win this book!!! I love the idea of these patterns so much. That vest speaks to me too! Thanks for the giveaway, Susan. I saw several things there I'd love to knit beginning with that beautiful hat! I have loved interweave's Jane Austen inspired knits, so I am glad to see that they are doing Downton Abbey. I have loved interweave's Jane Austen inspired knits, so I am glad to see that they are starting this series. The patterns in this issue are awesome! I haven't seen Downton but love all the period details! What a fun magazine. I am hooked on the show so I will need to get this:). I think the cosycoat might be first on my list. Thanks Susan for this offer. And congrats on the nomination. Your Craftsy class got me started making toys! I love that hat and I love that show! KNITTING AND DOWNTON ABBEY: WHAT A WONDERFUL WORLD!!!! 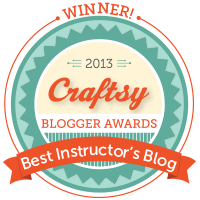 Congrats on the Craftsy Blog Award! I agree completely. Also, thank you for this wonderful giveaway. I love the scenery and artistic set use in Downton Abbey. 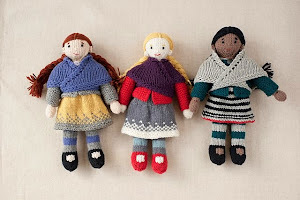 These projects look wonderful to knit and enjoy! What a beautiful magazine and thank you for the chance to win a copy. Also congratulations on your Craftsy nomination. I voted for you. Well of course there is a Downtown Abbey knits mag! So fun. Thanks, as always, dear Susan. Great patterns. Thanks for the opportunity, Susan! First. Congrats on the instructor honor and good luck! 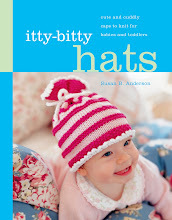 I would to win this pattern book and yes the hat with the little pompoms is sweet. I've seen the magazine at the local yarn shop and it's wonderful! Absolutely beautiful designs. Love how feminine they are. Such a pretty tweed vest! The patterns look great and the extra bits of history sound so interesting! I too would love to have a cosycoat! !Thank you for the chance to win this magazine! What a great giveaway! I'm a huge Downton Abbey fan. would love to win. Love the show.. the chilly morning cozycoat is perfect. We have that kind of weather here in the desert. Went over to craftsy to vote first and saw you are leading the pack. I can see why I love your class and have watched it a couple of times. Love the vest in the photos I totally agree that this is a vest that would come in handy for our Wisconsin weather. In fact this morning it would be a very welcome addition to my wardrobe. Would be awesome to win the magazine...Such stunning patterns. Would love to win a copy of this! So many amazing designs. I am such a Downton Abbey fan! I would love to win this magazine! I am such a Downton Abbey fan, I would love to win this magazine! Very classy! I'd love to win a copy of the magazine! I love all the vintage knits that have been popping up again. To me these styles are so timeless. Also, congrats on the nomination. I sure love reading your blog! Great show and looks like an interesting magazine. What beautiful designs!! I love the colorwork hat and the brown sweater in particular - just gorgeous! Hello! I would love to win a copy! 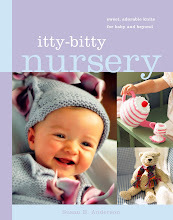 Hi Susan - I can hear the Downton Abby Music now - the patterns in this book are delightful! Thanks for the opportunity. I know I can't wait for Downton Abbey to return in January! Having this magazine might help me be less impatient! Thanks again for sharing! Love Downton Abbey! Love many of the patterns! Thanks for the giveaway. I could use a morning or afternoon losing myself in Downton again! Love Downtown Abby and would love to win this book! Thanks for the chance to win a copy! Would love to win this magazine. Love Downton Abbey and these patterns! Oh! I hadn't even thought to look for patterns inspired by the show. I love watching and admiring all the fashion, and the patterns here look like a lot of fun. Already have my eye on the cozycoat. The yarn is sitting in the basket waiting to be knitted! But, I do need the pattern! Love the show. How awesome to have a copy of this magazine - the patterns look wonderful. I'm in! knuts2knit on Ravelry. Oh my! I have to knit Chilly Morning Cosycoat!, love love it!! I love the Downton Abbey styles. (voted for you too) I'm anxiously waiting for next season to start. I didn't think I would be interested in this, but there are a lot of good projects in there! I love Downton Abbey and this magazine looks like it has great designs that depict the time frame. Who wouldn't want to win that book? Thanks for the chance. Would love a copy of this magazine! Pick me, please! Love Downton Abbey! Looks like a great issue and I would love to have it. Lovely interesting patterns. Thanks for the opportunity to win a copy. Like so many others, I feel in loved with Downton Abbey from episode 1! Looks like a great magazine. Thanks for offering the giveaway. Have to admit I have never watched Downton Abbey! Better check out what I have been missing; love the historical connection to these patterns and they are so wearable today. Truly classic! Love Downton Abbey + love your blog!! I love the show. I love the magazine. Thanks so much! Love the idea! Such great patterns. I already have this magazine, just chiming in about the Chilly Morning Cosycoat. I took my mom to a LYS and she was leafing through the magazine and found that. And bought yarn. And the magazine. So I guess I know what I'm making Mom for Christmas! My daughter is also a HUGE fan of Downton Abbey, and I'd love to be able to knit her something from this magazine as a Christmas present. Thanks for the lovely giveaway! I love Downton Abbey! Thank you for another giveaway opportunity! Can't wait to see this mag in person. Huge fan of the show - looking forward to new episodes in January. Awesome! I'd love a copy! Someday I will learn the proper way to leave a comment...just in case last attempt did not work...love the fun hat/cravat and vests...most of all live seeing your blig in my email. Thanks for all the joy! Thanks for a chance to win this magazine! What a gorgeous magazine, and the knits are fabulous! I've had my eye on this magazine. I would love to win it! Thanks!! 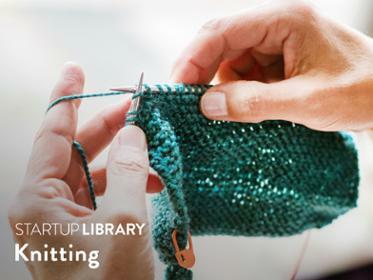 Like you, there are so many projects I'd like to knit from this wonderful book. I'm an old-fashioned kind of gal. 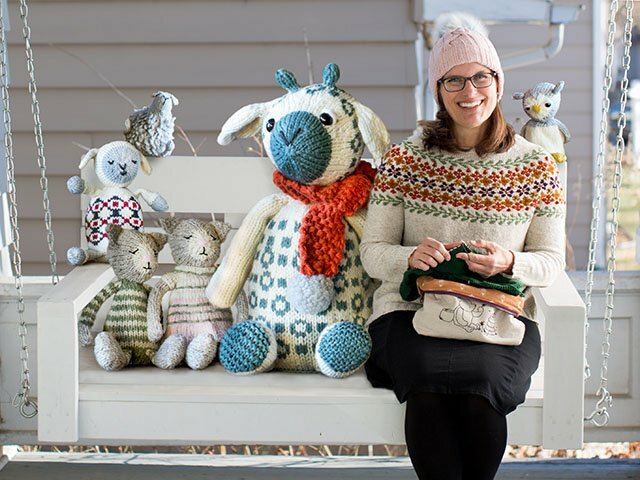 There are so many cute projects in the magazine. I would love to win a copy. Savannagal on Rav. There's so many cute patterns in the magazine. I would love to win a copy. Savannagal on Rav. Looks like a beautiful magazine! Thanks for another chance at a great giveaway! Love the historical aspects to knitting. I would love to win this magasine. 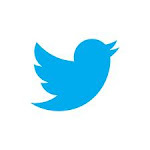 Thats beutiful recepst/pictures. I have a few magazines that I inherited from my husbands grandma with some great vintage knits but these pictured are vintage without being old. Love the chance to make them for a loved one. Wow those are beautiful patterns! Consider me entered. :) theferret on ravelry. This will be a great compliment to our Downton Sunday Evenings, complete with tea and a British Dessert! Thanks. I would so love to win! Thank you for this giveaway. 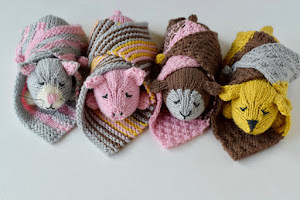 There are at least three patterns I want to knit ... please choose me! I love the hat & the series...I would love this magazine. Thanks for the giveaway. I know the feeling of getting lost in an Interweave Publication. Would love the book, and Downton Abbey is one of ,my passions too! I can't get enough of Downton Abbey! I would love to own this and dream as I read through it. 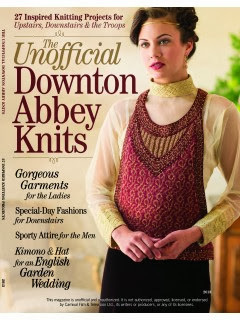 My daughter is a huge Downtown Abbey fan and would love most anything I would knit her out of this magazine!! Would love to have the unofficial Downton Abby patterns. We visited High Clere Castle last summer. Looked through this magazine at knitting- Would love my own copy! Love! Thanks for a great giveaway. Oh! 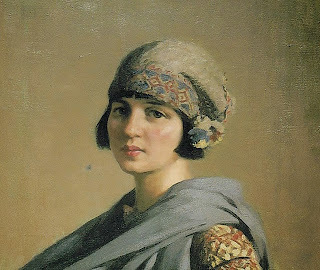 The Fair isle hat is beautiful! Oh! I love the Fair isle hat! Love Downton Abbey! Great giveaway! The Downton Abbey magazine has beautiful designs. What a wonderful give away! Love the hats and the lacy blouse!